Graduation season is upon us, and we know that finding the perfect gift for a recent grad can be tough. You want to choose something that’s meaningful, useful, and will have a lasting impression on a young person going off into the world. Happily, we have the perfect gift idea–a copy of Twelve Recipes, the New York Times bestselling cookbook by Chez Panisse chef Cal Peternell that was inspired by recipes and lessons he gave his son, a new graduate. The Blackberry Crisp from Twelve Recipes is the perfect dessert for a graduation party–tart and sweet, easy to make and serve. Try it out for your graduate’s celebration–and then give them a copy of the book! Purchase a copy of Twelve Recipes from your favorite retailer. For a couple of adolescent years, having finally abandoned his long and robust campaign of lobbying for a video game unit, Milo fixed on a new cause. He would make soda—his own flavors, handcrafted—and market them. He was, I think, not so interested in cashing in—he just wanted the unlimited soda that inevitably would flow and end the parentally imposed drought. We didn’t say no, but we weren’t particularly helpful in his soft-drink venture, so he was on his own to mash blackberries, wild mint, and tiny sour plums in the bottoms of jars before adding sugar. Bubbly water we begrudgingly supplied. Though Milo loved making these potions (hoping further, perhaps, that one of them might conjure a way out of muggle-hood), the drinks weren’t especially good—possibly because we kept the lid on the sugar bowl—and when the soda business went the way of the video console, we started making wild blackberry crisp. Almost any fruit works in this recipe. In the summer, it’s nice to mix nectarines or peaches with the berries. In autumn, pears or apples, maybe mixed with a few raisins or dried cherries, make a delicious crisp. Substitute almonds or hazelnuts for the walnuts if you like. Serve hot, warm, or at room temperature with cream, whipped or not, ice cream, or plain yogurt. In a medium mixing bowl, combine the nuts, 1¼ cups flour, brown sugar, 3 tablespoons of the granulated sugar, cinnamon (if using), and salt. Dice the butter as best you can and use your fingers to rub the butter into the flour mixture. You want it to have a moist, crumbly texture that clumps together some and holds its shape when squeezed. Toss the berries with the remaining 1½ tablespoons flour and the remaining 1 tablespoon of granulated sugar and spread them in a 2-inch deep 7 × 10-inch baking dish (you can also use an 8-inch cast-iron pan). 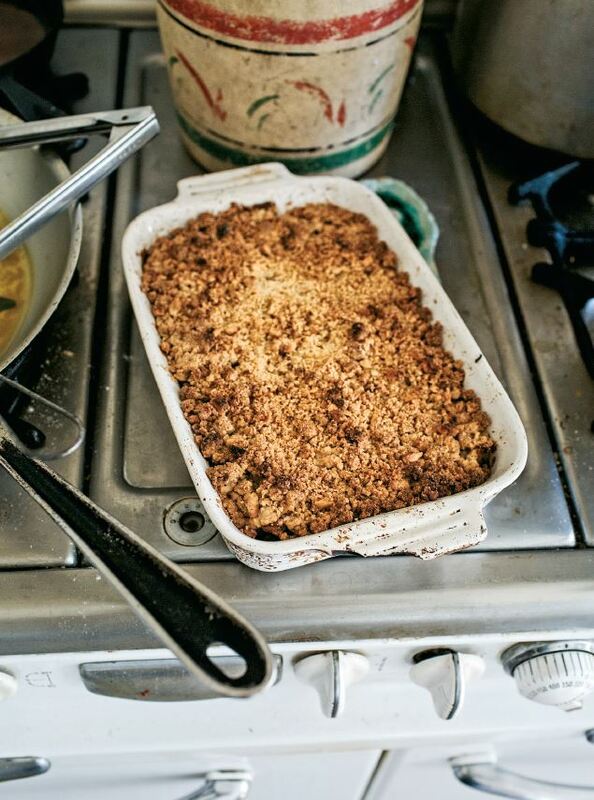 Spread the crumbly topping evenly over the fruit and bake until hot throughout and browned on top, 30 to 40 minutes, depending on the depth of the dish. If the top is getting too dark before the middle is hot, cover with foil and bake a little longer. Let sit for at least 5 minutes before serving.